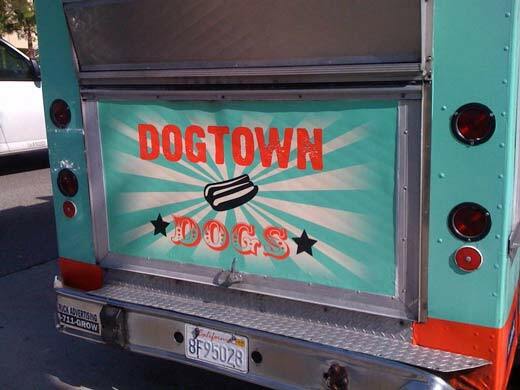 Recently I've been hitting the food trucks hard, so hard in fact that I have a backlog of reviews to do. Rather than do up a full review of each truck, I thought I'd experiment with a quickfire review format. This is the last in a series of five mini-reviews. Was it good? : Like Frysmith's chili fries, these fries soaked up the juices of the beef stew in which they swam, and were all the tastier for it. The beef was melt-in-your-mouth tender, and the onions were plentiful (and you know I love me some onions). There was white rice on the side, but I'm not big into plain white rice: I see it as a chunk of calories I'd rather spend on something with a bit more flavor. Overall experience: The dudes at Lomo Arigato don't go the extra mile for their customers. That's a compliment, not a criticism: read on for an explanation. 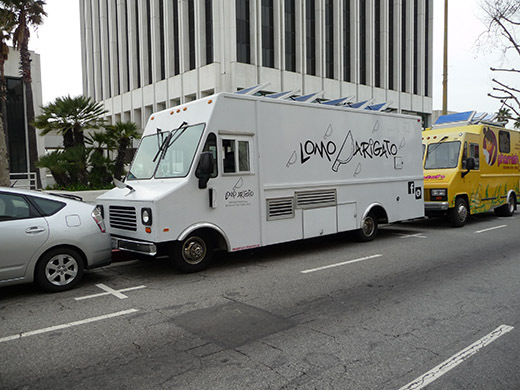 See, right before my husband and I arrived at Mid-Wilshire, the parking goons had shown up and demanded the Lomo guys move their truck. We walked up a minute later to find the truck with doors down, and the chefs standing on the street talking. "We asked if we could just move the truck into a space down the street," one of the guys told us, "but they said, 'No, it has to be a mile away.'" We all agreed that this sounded dodgy, and that because the goons really had no good reason to move the trucks along, they were now just inventing random parking laws. 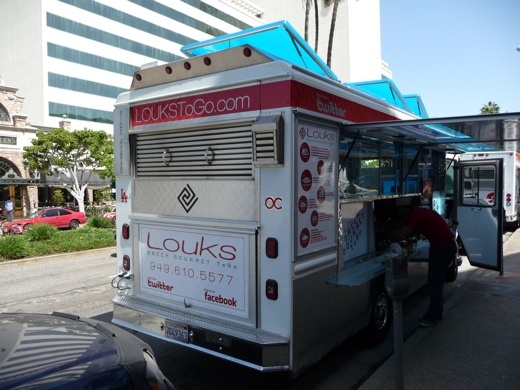 Still, the Lomo guys weren't going to protest right now; they wanted to keep serving lunch. 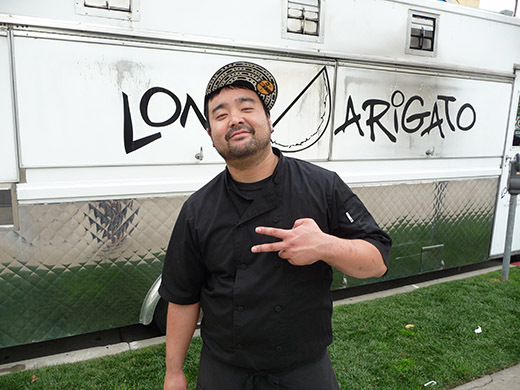 "We'll open back up real quick before we move, though, just for you guys," chef/owner Eric Nakata said, and he pulled up the doors and hopped back in the truck. How nice is that? 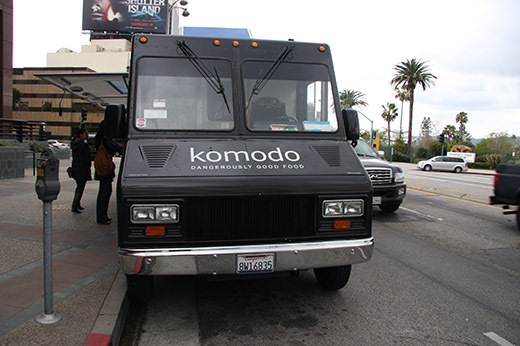 We got our lomo saltado with a side of awesome customer service! Vegetarian-friendly: You can get both the lomo saltado and the chaufa (fried rice; $7) with tofu. It's unclear whether they do the tallarin (Peruvian spaghetti; $7) with tofu as well - I'll ask, and add a note here when I know. Vegan-friendly: The lomo with tofu is vegan; the chaufa has egg, so it's not. The tallarin is vegan if you can get tofu on it. 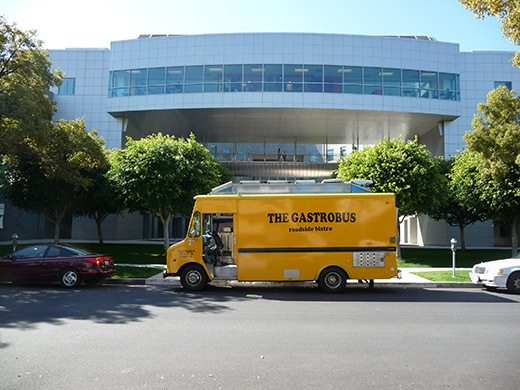 Recently I've been hitting the food trucks hard, so hard in fact that I have a backlog of reviews to do. Rather than do up a full review of each truck, I thought I'd experiment with a quickfire review format. This is the fourth in a series of five mini-reviews. Was it good? 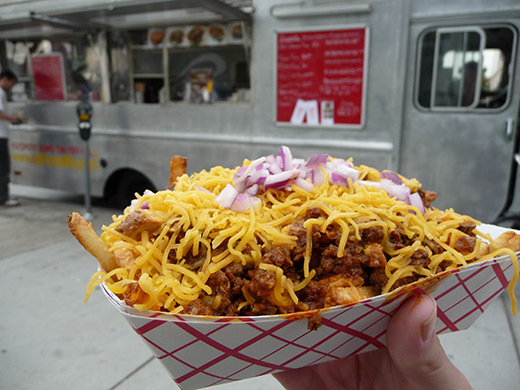 : Made with beer and chocolate, the chili was some of the best I've had in a long while, on top of fries that got soggier and more starchily delicious as they soaked up their topping. Capping it off were lashings of grated cheddar cheese. I ate it with a fork, and got it all over my face, and I loved every minute of it. Plus, it didn't give me a stomachache, despite my having eaten it as my first meal of the day, and despite it being filled with fatty, greasy cholesterol-y insanity. I'd already decided it was OK by me to suffer a little for some chili cheese fries, and now I'd had all the fun without the punishment. Magical. They didn't have their famous kimchi fries ($6) the day I went, but next time I'm going to get them. 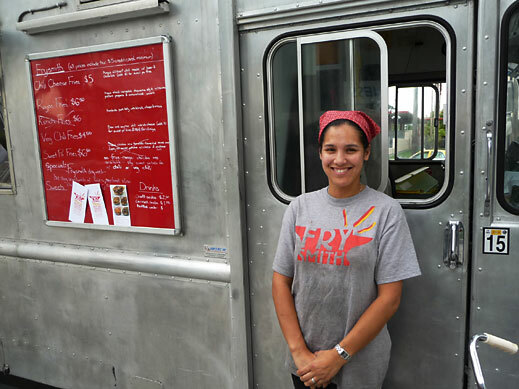 Overall experience: Brook Howell and Erik Cho, the owners and operators of Frysmith, were very friendly and welcoming. We talked about the look of the truck: they achieved that brushed-metal finish themselves, with gallons of paint stripper and a sander. 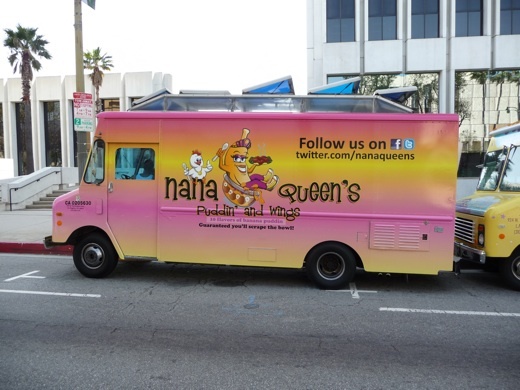 Running a fry-centric truck means customizing its kitchen. 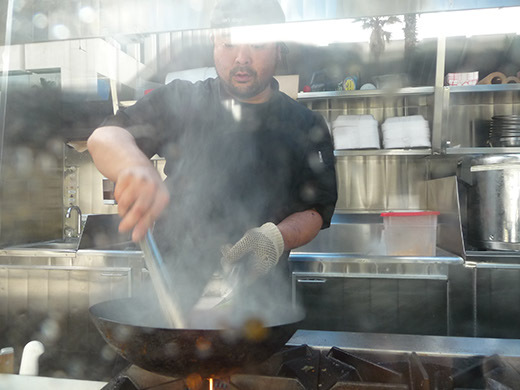 Whereas most food trucks have a standard kitchen with one small deep-fryer, Frysmith has four large fryers in a row, with a big window so customers can see the action taking place. The guy who built their truck installed Plexiglas: an error, it turned out, because as soon as the fryers fired up, the window got so hot it started to warp. Real glass is going in soon, Brook says. Vegan-friendly: ...or without cheese. 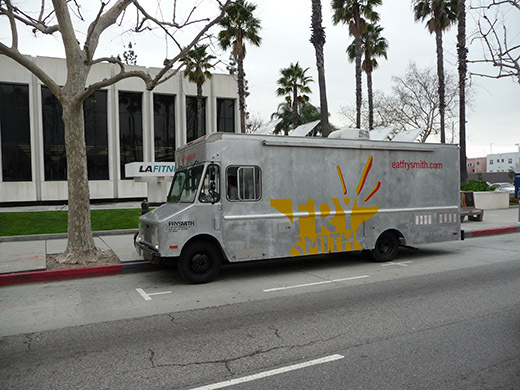 I know it doesn't seem like much of an option, but it's important to remember that often with these trucks, there are only a few items on their menus, so what looks like slim pickings for vegetarians/vegans actually makes up a sizable chunk of the menu. 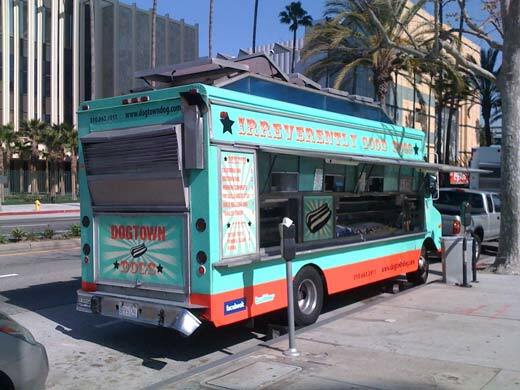 Recently I've been hitting the food trucks hard, so hard in fact that I have a backlog of reviews to do. Rather than do up a full review of each truck, I thought I'd experiment with a quickfire review format. This is the second in a series of five mini-reviews. 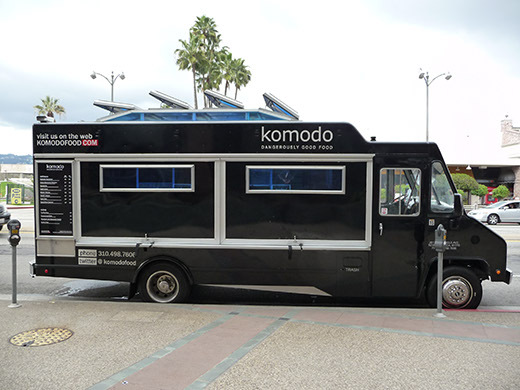 What I ordered: Meatballs with Romesco sauce ($5); fish and grapes taco ($2); asian marinated chicken taco ($2); Komodo signature taco ($3). Was it good? : I'd read rave reviews of the fish and grapes taco. It was very good, but it didn't knock my socks off. The fish was nice and light, but I'd have liked a bit more punch to its flavor, to contrast with the acid and the sweetness of the grapes. Maybe whole grapes, rather than the halved ones in the taco, would have given a crunch to the dish. The meatballs were full of sausagey awesomeness, and got spicier the more I ate, till I was sweating slightly. The orange Romesco sauce drizzled on top of them was nutty and garlicky. My 22-month-old son Owen decided to dip his sneaker in it and then wipe it on me. 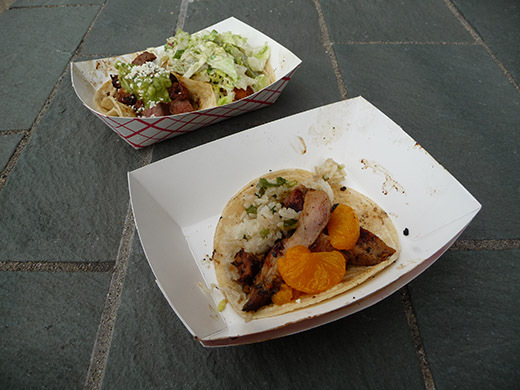 The marinated chicken came with little orange segments, and the Komodo signature taco had delicious meat. Vegetarian-friendly: No main dishes are, unfortunately. Truffle fries and garlic fries are meat-free. The guacamole rolls (wonton-wrapped guacamole sprinkled with Old Bay herb seasoning; $5) are also vegetarian. Vegan-friendly: Truffle fries are; garlic fries are topped with parmesan, so ask for no parm if you're vegan. The guacamole rolls are vegan as well as vegetarian. Recently I've been hitting the food trucks hard, so hard in fact that I have a backlog of reviews to do. Rather than do up a full review of each truck, I thought I'd experiment with a quickfire review format. This is the first in a series of 5 mini-reviews. 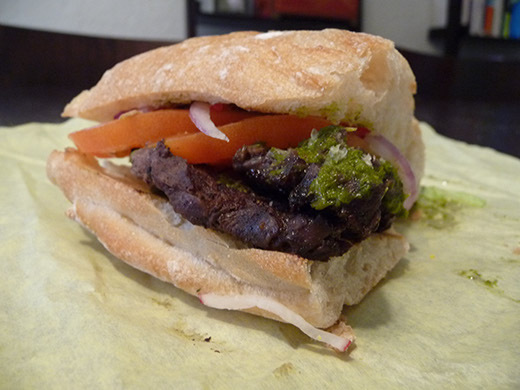 What I ordered: Skirt steak sandwich with onion, tomato and chimichurri ($6); sweet potato fries with honey mustard dipping sauce ($2.50); potato soup; beet greens. Was it good? : Hells yes. The steak was smoky and juicy. Honey mustard added a delicious tang to the mellowness of the fries, making the flavor multidimensional. I expected the soup to have a cream base, but it tasted like it was made with chicken or vegetable broth instead: it was interesting to eat a potato soup that was so light. 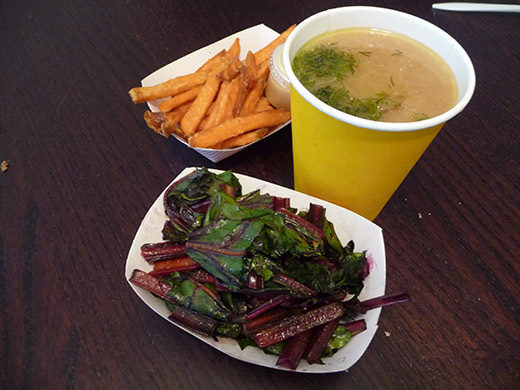 The beet greens tasted like chard; they were very tender, and their crunchy stems were a beautiful shade of hot pink. Overall experience: On a hot day outside MySpace, the line wasn't long at all, and the food came out fast. Vegetarian-friendly: There's a veggie sandwich on the menu featuring yams, zucchini and balsamic onions ($6). 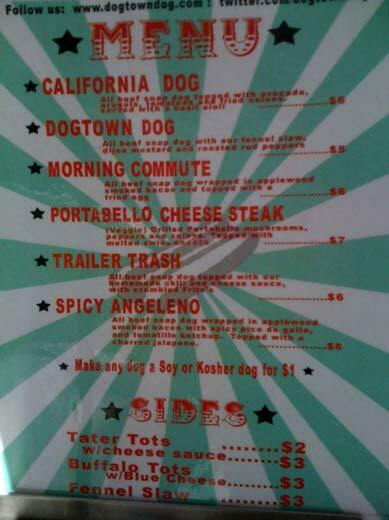 Also, check their daily specials when you visit the truck. Vegan-friendly: The veggie sandwich is good for vegans too.